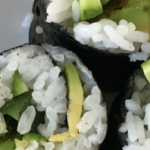 Learn the basic techniques on how to make sushi rolls, start by making allergen friendly cucumber and avocado sushi rolls. Once you master the basic techniques of making sushi with simple ingredients, you can make sushi with other fillings. 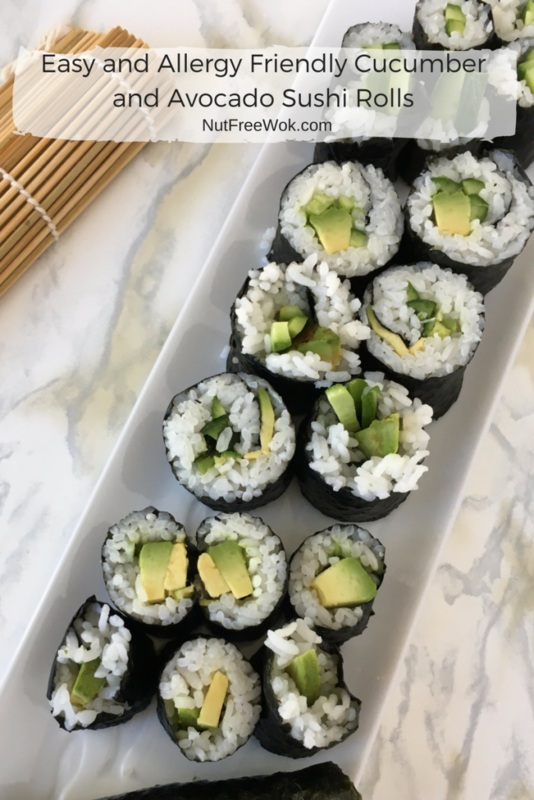 In order to make cucumber and avocado sushi rolls you need three basic ingredients: nori, fillings, rice, and seasoning for the rice. 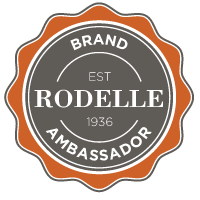 I use safe ingredients that we normally eat such as cucumbers, avocado, unagi (eel), shrimp, and crab to make some simple and allergy safe sushi rolls. Making cucumber and avocado sushi is a delicious but low commitment way to learn how to make sushi before venturing to make other kinds of sushi. Disclosure: This post may contain some affiliate links, which do not affect your price but if you make a purchase, the links allows me to earn a small commission which help pay for website operating costs. Thanks for your support. You will have the best results if you use a Japanese rice or a medium grain rice such as calrose rice. Be sure to wash the rice until the water is no longer cloudy and soak the rice for at least 20-30 minutes before cooking it. If you need some help with the basics of making rice and recommendations for a rice cooker, be sure to read my blog post All About How to Make Rice. Seasoning your cooked rice with rice vinegar, sugar, and salt not only helps to flavor your rice, the seasonings helps to preserve the rice and keep it from spoiling quickly. Sushi rice is traditionally seasoned in a shallow wooden bowl called a hangiri (affilate link), which is wide to help the rice cool down quickly and the wood helps to absorb excess vinegar. If you don’t have a hangiri, use a glass or ceramic bowl and avoid using any metal bowls which might react with the vinegar. Transfer the hot steamy rice with a plastic or wooden rice paddle (avoid metal). I use a large glass bowl and add my rice vinegar mixture gradually. Once you add the rice vinegar, gently fold in the rice vinegar mixture without smashing the rice, and fan the rice to cool it off at the same time. Be sure to use rice vinegar, results will vary significantly if you substitute with any other kind of vinegar. Sometimes you might see seasoned rice vinegar, which is fine but it might already contain salt and sugar, so adjust your ingredients to taste. If for any reason, you cannot consume rice vinegar, omit the rice vinegar but eat your sushi immediately. 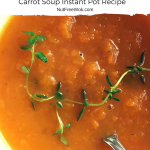 Some recipes use a lot more sugar than I do (about 1 tablespoon per cup of cooked rice), I reduced the sugar for health reasons but you can adjust the recipe to your taste. You can heat up the vinegar mixture in a small pot or in the microwave if the salt and sugar don’t dissolve. Don’t add all of the rice vinegar mixture at once, add 1/2 or 2/3 first so that the rice can absorb the vinegar and then taste it. If needed, add the rest of the vinegar mixture. Be sure to fold the rice vinegar gently into the rice as you do not want to damage or smash the rice. Bamboo sushi mats are an essential tool to making sushi because they help you to lift the nori sheet and rice and form the roll without tearing the nori sheet. I have a handful of bamboo sushi mats (affiliate link) so that everyone can make their own sushi rolls if they want. If desired, you can wrap the sushi mat with plastic wrap to keep the mat clean or if you decide to try making an inside out roll. I place the bamboo sushi mat down on a cutting board or other clean surface with the bamboo horizontal to me so that I can roll the sushi upwards and away from me. Usually sushi is wrapped with a nori sheet, which is a paper thin sheet of seaweed. Nori sushi paper is made from seaweed and is usually allergen free, with the exception of sesame (some companies flavor their seaweed with sesame oil) and shellfish/fish (cross-contact is possible since seaweed might be accidentally harvested with fish or shellfish). As an alternative, I’ve also seen some colorful soy based sushi paper and they’re so pretty and have a sweet taste to them. You want the nori sheets to be fresh and crispy and if the package of dessicant inside the package feels big and puffy, that is a tell-tale sign that the nori might be stale. I usually buy Yamamotoyama nori sheets for about $5 from my local Asian supermarket but it’s also available at Amazon for a reasonable price. I recommend that you buy only as much as you need because they don’t keep well. You might be able to find other brands from China or Korea but be sure to select a package of nori that looks almost black, not brown or green. Notice that the lines on the sushi paper line up with the sushi mat, leave a little room at the top to seal the roll. Add your filling, roll it up partially and then make sure the first roll is nice and tight before proceeding. 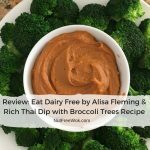 If you are making a small single ingredient skinny roll such as a cucumber roll or an avocado roll, then you will use a half sheet. If you are making a regular sized roll with more than 2-3 filling ingredients, such as a cucumber and avocado sushi roll, then you will use a full sheet. Place your nori sheet down on the sushi mat with the smooth side down (rough side up) and be sure that the shape and the lines of the nori sheet line up with your mat. You will need a small bowl of cool water to dampen your fingers. Use your fingers or a rice paddle to gently spread the rice out in a thin layer, do not smash the rice and be sure to spread the rice all the way out to the left and right edges and use a spoon to fill in patches and edges with more rice as needed. Leave a 1/2 inch margin at the top in order to make it easier to seal the finished roll. Place your filling ingredients about 1/3 of the way up from the bottom and gently press them in with your fingers. No matter what, do not overfill your roll otherwise you’ll have a mess and end up eating a sushi roll bowl. Use your thumb and index finger to lift the sushi mat and your other fingers to keep the filling in place and fold the nori and rice over the filling. Make the roll nice and tight, by using your fingers to gently squeeze the mat and the half formed roll and then use one hand to lift the sushi mat and the other hand to roll the roll on itself. Be careful not to roll the sushi mat into the sushi roll. Right before you reach the end, wet your fingers in a bowl of water and lightly dampen the top edge of the nori and seal the roll. Tuck in any stray rice and fillings at the ends and rewrap the roll with the mat and give the roll a gentle squeeze. Remove the sushi mat and allow the sushi roll to rest seam side down for a few minutes. I make all of the rolls and then cut them. I like using a bread knife to cut the sushi into 6 bite sized pieces because the serrated edges will make clean slices or a santoku knife which is not as sticky as a regular chef’s knife. It’s important to use a damp knife and to wipe or clean the knife in between every other cut, otherwise a sticky knife will tear into your roll. Japan has a lot of traditions regarding how to eat food and if you know better, you can do better. According to “The Rules of Sushi” if you are given a hot damp wash cloth or a moist wipe, then you may eat your sushi with your fingers, otherwise use your chopsticks. Whatever you do, do not stab your food with your chopsticks, use your chopsticks as a knife, or rest them upright in your sushi or rice bowl. The worst offense is to rest your chopsticks upright in your food as that is considered a death omen in some Asian cultures. Rest the chopsticks on the side of your plate or use a chopstick rest if available. If I’m dining out, I fold my paper chopstick cover into a bow to use as a chopstick rest. Since the rice is already seasoned, there is no need to dip the rice portion of the sushi into soy sauce. The soy sauce is intended for flavoring seafood as desired. 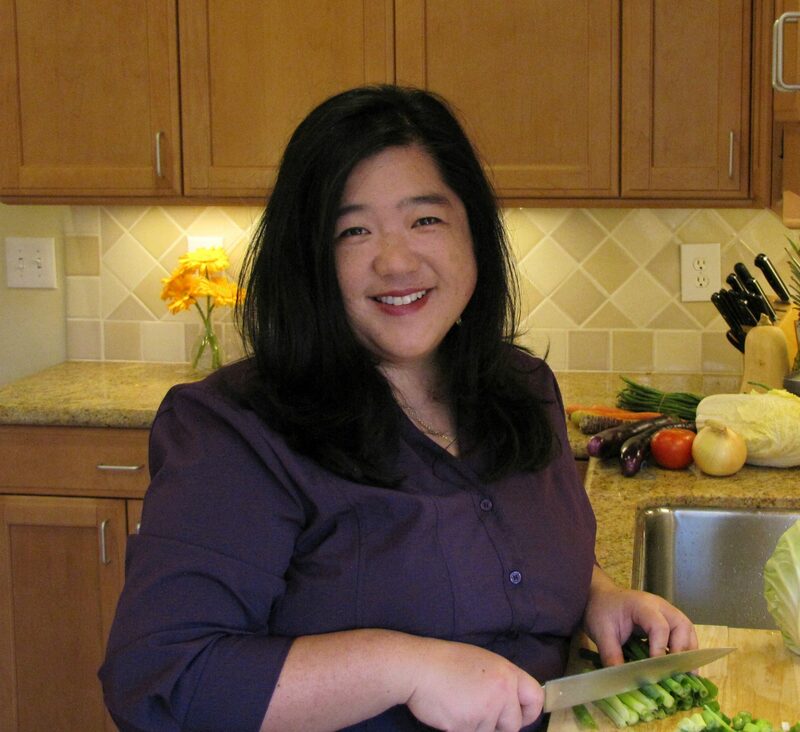 And while many people stir wasabi paste into soy sauce (that’s what I do! ), a small piece of wasabi paste is supposed to be placed on the sushi rather than dipping the sushi into a soy sauce wasabi mixture. And one is supposed to eat pieces of pickled ginger in between pieces of sushi to cleanse one’s palate. 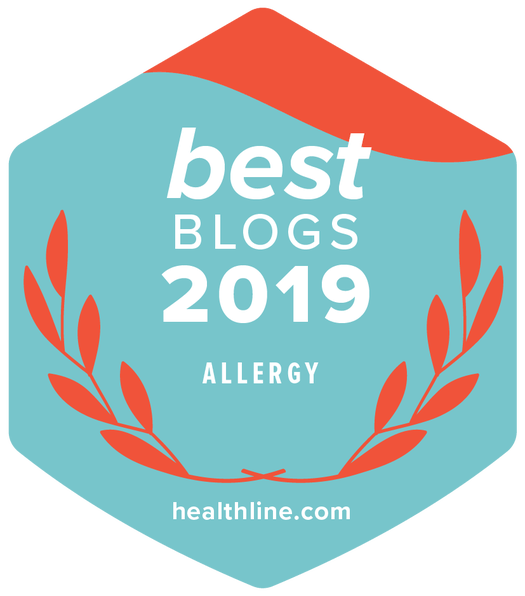 I have a lot of information about finding allergen information for soy sauce and tamari (which is made without wheat) in other blog posts. Wasabi paste is made by grating a wasabi root, which is a plant in the horseradish family. 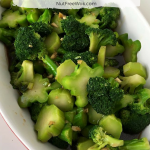 However most wasabi paste might not be really made from wasabi root but consist of grated horseradish root and some food coloring and often sold in a powder or paste form. If you are at Japanese restaurant, they might or might not have an ingredient or nutrition label available for wasabi or pickled ginger. Since it’s very likely the strong tastes of wasabi or ginger won’t appeal to our children, I’ve never asked. If you know you love wasabi, my readers Cathalina and Sally tell me that Spicely carries a wasabi powder. Another alternative is to order wasabi plants to grow your own or order whole wasabi roots to grate from The Wasabi Store. 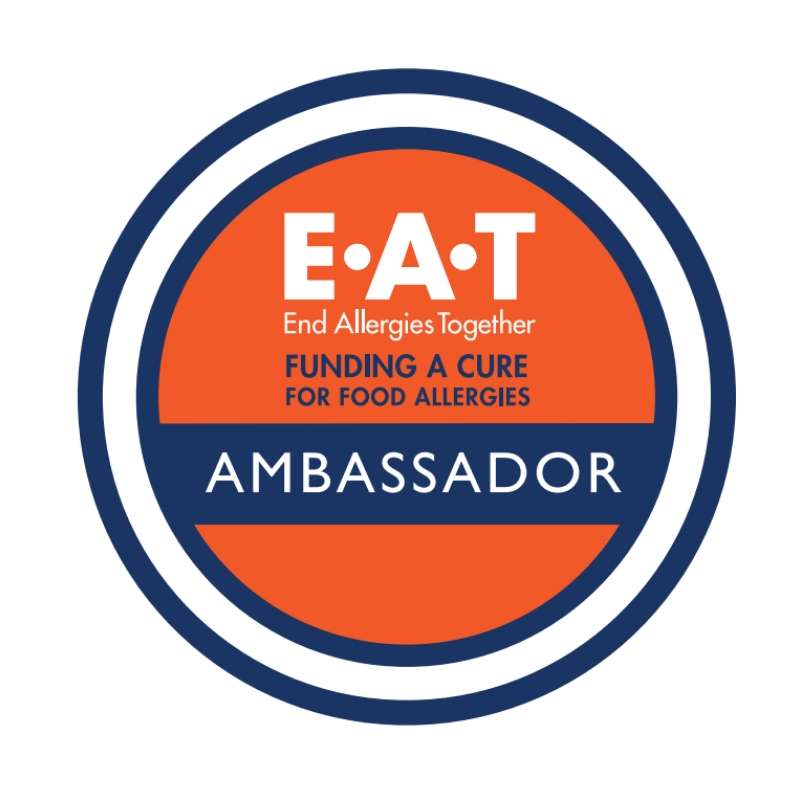 Both options are free from cross-contact with top allergens. Everyone has different allergies and different levels of sensitity, and most people use a tiny amount of wasabi so use your own judgement if S&B’s paste is an appropriate product for you to use. Pickled ginger is a little more difficult to source allergen safe. See what’s available in your local stores and read the label or follow up with a phone call. 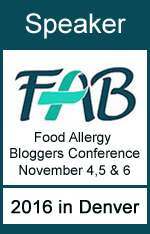 I checked online and found brands such as Wel-Pac (I believe that is distributed by JFC, you can email them for allergen advisories) and The Ginger People (organic, you have to call to confirm, some of their other products are in shared facilities with nuts). 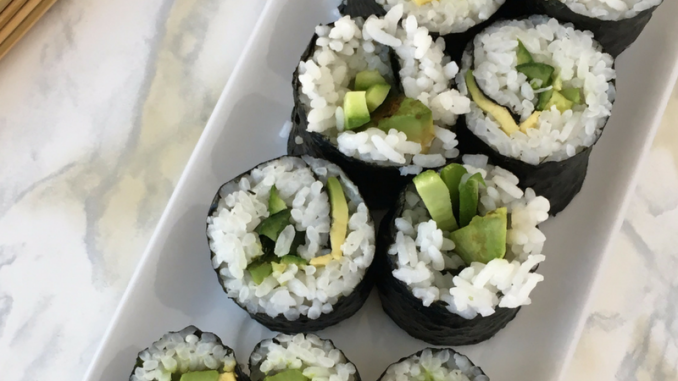 This cucumber and avocado sushi recipe is free of the top 8 allergens as written. You can make some cucumber sushi rolls, avocado sushi rolls, or cucumber and avocado sushi rolls. Our family is used to eating our sushi without dips or ginger, but I’ve included them as optional ingredients. This recipe will make approximately 8 skinny rolls or 4 regular rolls, or some combination of both, depending on what you like. You might have some extra filling left. Allow extra time (approximately 60-90 minutes) to cook rice if needed. One cucumber and avocado roll is approximately 271 calories, a cucumber-only roll is about 210 calories. Combine the vinegar, sugar, and salt in a small bowl until the sugar and salt dissolves. Place hot rice in a large non-reactive bowl and sprinkle some of the rice vinegar mixture on the rice, gently fold to combine the rice and vinegar while fanning the rice at the same time. Add more of the rice vinegar mixture to the rice to taste. 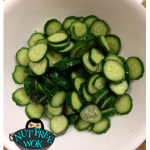 Cut thin slices of the cucumber lengthwise, avoid using the soft seeded parts. 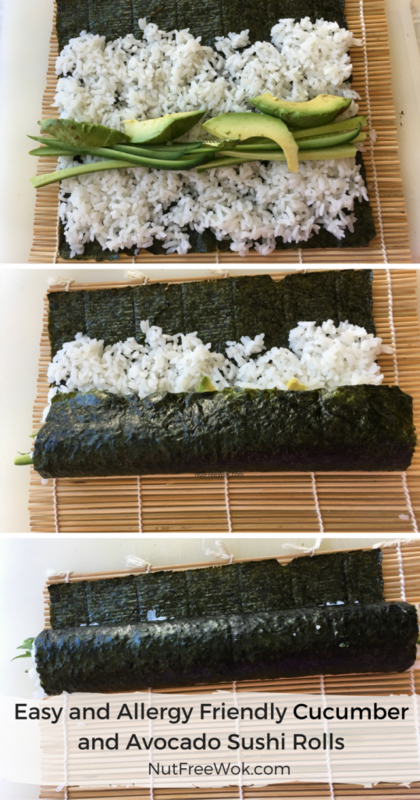 Place a half a nori sheet smooth side down on your sushi mat and gently spread 1 small scoop of rice (about 1/3 cup) on the nori sheet, fill in any empty spots or the edges with a small spoonful of rice (use about 1/2 cup of rice total). Place 1 row of cucumber or avocado slices (about 1/2 inch) on the center of the rice and gently press in. Lift the mat to roll the sushi, using your fingers to keep the filling in place, and gently pressing the roll together (see article for detailed instructions), wet your fingers in a bowl of water and lightly dampen the top edge of the nori and seal the roll. Place a full nori sheet smooth side down on your sushi mat and gently spread 1-2 small scoops of rice on the nori sheet, fill in any empty spots or the edges with a small spoonful of rice (use about 1 cup of rice total), leave 1/2 inch margin without rice at the top. Place your cucumber and avocado slices on the rice about 1/3 from the bottom, no more than 1 inch of filling. Rest the rolls seam side down until you finish rolling all of the sushi, then cut the rolls into 6 pieces with a clean damp serrated or sharp knife. What are your favorite types of sushi? Tell me in the comments. I love sushi-eel, yellowtail, salmon, it’s all great!